If you happen to watch Netflix on your Android devices using the company's official application, you may have noticed already that the application's interface changed after the most recent update the company released to Google Play. The changelog lists a number of new features, the two big ones are the redesigned interface and the addition of a fast forward button to skip ahead when you activate it. The update is already available and you may have received it already if you have the Netflix application installed on an Android device. 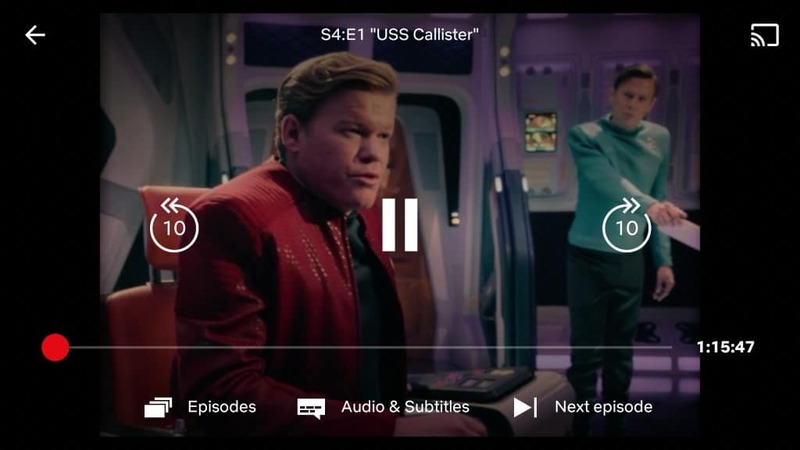 The playback interface of the Netflix application has been redone completely. You may remember that the old Netflix displayed some controls at the bottom of the screen and others at the top. The pause button, for example, was placed in the lower left corner of the screen which many users found to be a weird location for such an important option. The new interface moves the pause button to the center of the screen. It is flanked by the back and forward buttons which let you go back or forward in 10 second steps. 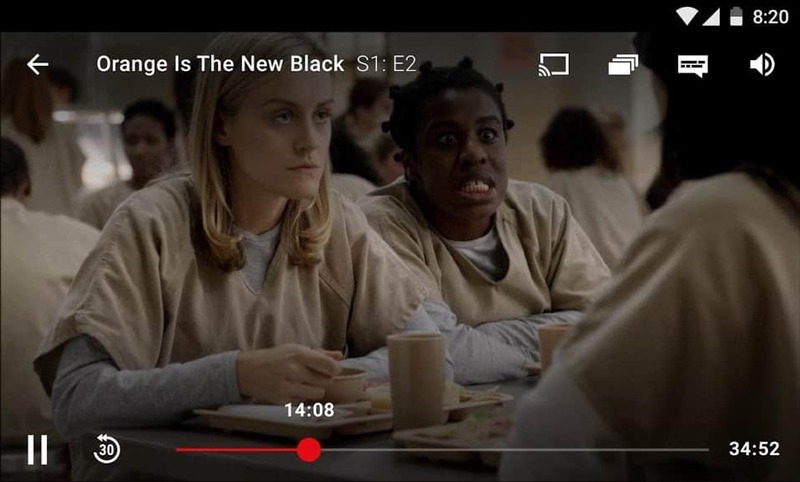 The old Netflix application did not support a forward button; the back button was set to 30 second steps in the old application but Netflix changed that to 10 seconds with the update to offer finer controls. The Episodes, and Audio & Subtitles, have been moved to the bottom of the application interface. There you find the new next episode button as well to jump directly to the next episode (if it is available). Another useful change is that Netflix added text to each button to make it clearer what they do. While you knew that after some sessions, it is easier if the buttons are labeled clearly in the application. The buttons themselves are bigger in the new version so that it is easier to tap the right one in the interface. I have to admit that I don't watch Netflix on mobile devices as I prefer to watch shows or movies on a television. Netflix users who use the Android application are probably going to like the changes as it moves the interface more in line with other streaming applications out there. While the app does not support YouTube-like forward and backward options yet, getting a forward option at all is a step in the right direction. Now You: Do you use streaming apps on your mobile devices? As a mobile phone user from the first hour (1.1 kg in 1973), I say no way I am streaming on even a tablet. This opinion has nothing to do with the ferry poor quality (In main humble enough opinion I hope) of tv program’s Netflix is offering. I have a tablet that is used exclusively for YouTube, which is the only streaming service that I use anymore. I closed my Netflix account a while back because they were one of the three companies who pushed the EME into the HTML5 standard, and I didn’t want my money to go towards that sort of thing. 99% of my Netflix viewing comes through a device connected to my television. However, on the rare occasions when I travel, I watch on my laptop through a browser, and regularly use the laptop browser to manage my queue (or list, as they’ve started calling it now) even when at home. Sometimes when Netflix recommends a show via email or an app notification on Android, I’ll click through to add it to.my queue via Android (Rearranging the queue from my laptop later if warranted). I also can remember a time when having Android on my phone came in very handy. My car was in the shop or I was between cars in kind of a rural area and had used an Uber to get to a shopping center where I knew I could get a few groceries, some beer, some takeout Chinese, over the counter medicine, etc.- all in one trip to economize. I finished running the errands, and there were no Ubers available to pick me up, some were on the edge of their range, and would accept and then drive around on the wrong direction trying to get me to decline because they didn’t want to take the hit of cancelling, but really didn’t want to (and wouldn’t) drive out to where I was. So, there I was sitting there with stuff to get home and no transportation, just sitting around on a sidewalk leaning against a wall. I was very happy to have a phone with Netflix to watch episodes of a show I had been catching up on at home previously sitting there eating my takeout on the sidewalk. You know, we can all talk about how the experience of watching Netflix on a televison is ideal, a PC is next best, and who wants to watch TV shows or movies on a phone-sized screen anyway. However, when that screen is all we have and there’s a lot of time to kill in a situation that’s getting potentially stressful, it’s great to have the option of continuing to watch a series on the only device we routinely carry on the go day to day- our cell phones. Its a great value added to have the *option*. Even though its an option I might rarely use, knowing that I have it is something that plays into why I am usually subscribed to Netflix. A service that lets me use it the way I usually want to, but that also is adaptable on the fly to be used on almost any device, almost any Internet connection with sufficient speed and signal, and at any geographic location in the US is great. In general, things that offer flexibility are good. One never knows when something is going to break or one is going to find oneself in an unanticipated situation. Heck, if I couldn’t pay my Internet bill or there was an extended outage, I could even take the laptopto somewhere with free wifi and use Netflix’s feature where they let you download episoded for off-line viewing and “stock up” to watch them at home, later. If it didn’t support Roku and other boxes designed to get it to my television, I probably wouldn’t subscribe, because that’s my desired use case, but I can’t think of all the other ways to watch Netflix as being anything else but pluses. When I don’t want to use them, I don’t. When I do, I do.